SeizureTracker.com - Valet System - User Account instruction for sharing valet keys and setting access levels. The Valet tool allows Seizure Tracker users to to share access to their account with a Valet management account. Access levels can be customized for each valet relationship. 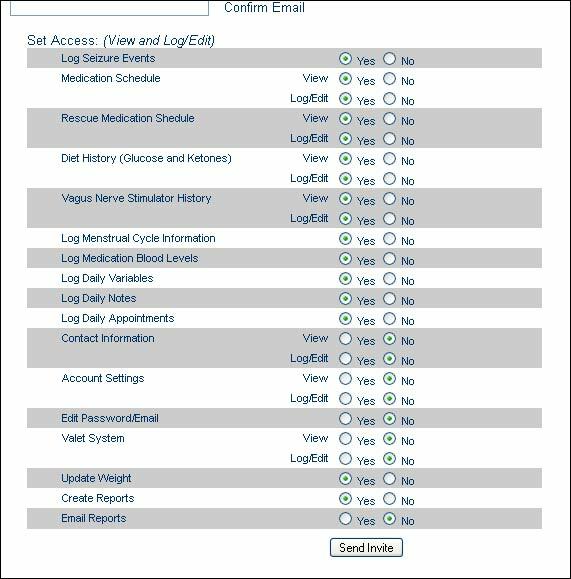 User account have full control of the valet relationship and can edit or delete access at any time. - Select the "Enable Valet System" option in the settings list. *If the tool is currently active, you will see the "Valet System" in the lower left corner of your control panel. - Visit the "Valet System" page by clinking on the link in the lower right corner of your control panel. - Enter the recipients email address into the invite form. - Set appropriate access levels. *Please note that giving access to the Valet System will allow the management account to edit their own access level. - Press the "Send Invite" button. *Once the invite is sent it will appear in the user account valet key list with a pending status. Valet key invite are sent to the email entered into the form and expire in 96 hours. The invite will need to be resent if it has not been completed by the recipient. *Valet management accounts have the capability of entering an alternative email address and name to appear in the user's key list. Once the key is accepted the email address and name may change to that selection if they have used that function. - Click the "Edit" link located at the top of the access settings for each invite in the valet key list. - Review the settings and make the desired changes. Click the "Delete" link in the to remove the valet key from both the user account and management account.